Faunia Madrid, or to give it its proper name (in Spanish) Faunia Parque Biológico de Madrid, is the newest of Madrids attractions and one all the family can both enjoy and learn from. Built with the aim of bringing the wildlife into the city it is an oasis of biodiversity amongst Madrids residential neighbourhoods. The 140,000 square meters of this biological park are home to over 1500 different animals from different climates and ecosystems. By creating four distinct zones within the Faunia park a number of otherwise unreachable climates can be experienced. These zones further contain a total of ten different pavillions offering distinct sub systems. Imagine yourself in the Artic wastes or a Tropical rain forest? Whilst primarily a gentle stroll looking at animals and different ecosystems Faunia Madrid has a serious side to it and its primary mission is to teach conservation in a fun way. This is done in a relaxed and informative way rather than a "look what happens if you don´t care for the environment" type scenario. This teaching style appeals both to the very young 1-4 yr olds as well as some of the more "rebellious" teenage types. Standing over a lava flow tends to grab most peoples attention! Even only if to figure out how did they do it! 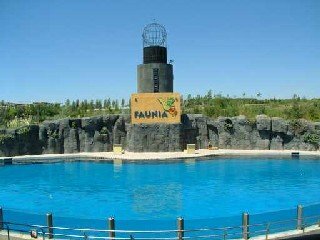 All in all Faunia Madrid offers a great chance to see that which you can not see at home as well as escaping the city for a day without having to spend more than 30 minutes travelling from the city centre! Prices can be checked directly with the official Spanish website for the attraction park: here. Note: Special extended opening times are put in place for public holidays however these days are not the best to visit Faunia Madrid as there are normally a 1000 and 1 other peopls doing the same! To check timings on the day of your intended visit use this Spanish page. 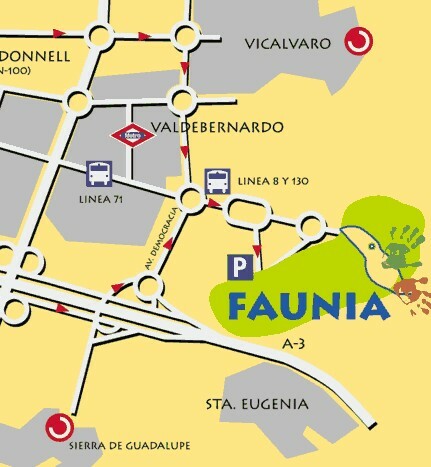 Faunia Madrid is well served from both downtown Madrid and outlying Madrid by Bus & Metro . Bus: Routes 8, 71, 100, 130 as well as special services on Weekends from Pavones. Metro:Valdebernardo, 500m from the park gates. Taxi:From Sol (Central Madrid) between 15 & 20€. Want something with animals a little wilder than Faunia Madrid? Check out Madrids Zoo & Aquarium!